Biography: Born in Edinburgh, Scotland, John Wilson grew up on the Isle of Skye and outside Glasgow, without the slightest idea that he would ever write books. After obtaining a degree in geology from the University of St. Andrews, he worked in Zimbabwe and Alberta before taking up writing full time and moving to Vancouver Island in 1991. John is the author of numerous articles, essays, poems and reviews, and almost fifty novels and nonfiction books for kids, teens and adults. He was a finalist for the Governor General's Literary Award (The Alchemist's Dream, 2007), and his books have won or been short-listed for most Canadian children's-literature prizes. 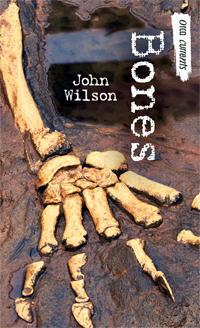 For more information, visit johnwilsonauthor.com. Will these bones survive their fifteen minutes of fame? Nothing says “I love you” like plutonium.